You are probably thinking – you just made this word up! I wish I did but it was first used in the banking sector in 1967. It means removal of intermediaries or cutting out the middlemen, usually because the service they provide has become unimportant, or easier and cheaper to do in another way. In our modern age of the internet, when people are only a click away from a vast amount of information and contacts, this becomes more and more relevant. Buyers can bypass the middlemen to buy directly from the supplier and pay less. A number of industries have been heavily impacted by this and many more will become exposed to it. When was the last time you used a travel agent or an insurance broker? Most of us buy our insurance directly via the web and book our next holiday using sites like Expedia, AirBnB, etc.. Many high street bookshops have closed as we tend to buy or download books from Amazon or similar. People have forever been complaining about estate agents charging a lot often for doing little and we are now seeing some owners advertising their own houses directly and successfully selling. It is logical – the owner can tell you much more about the house, the background, neighbours, any challenges, etc. than an agent can. Talking about often charging a lot for sometimes doing little, what about the recruitment sector? I can see the attraction of the few good agents for hiring companies who really have no time to look for candidates, nor do the vetting themselves, if cost is not an issue. However, most organisations I’ve worked with struggle to justify the 20-30% margin most agents (good or bad) charge, especially if the agent’s way of working is merely to bombard the hirers with inappropriate CVs and candidates that haven’t been properly vetted and let the hirer do much of the work. 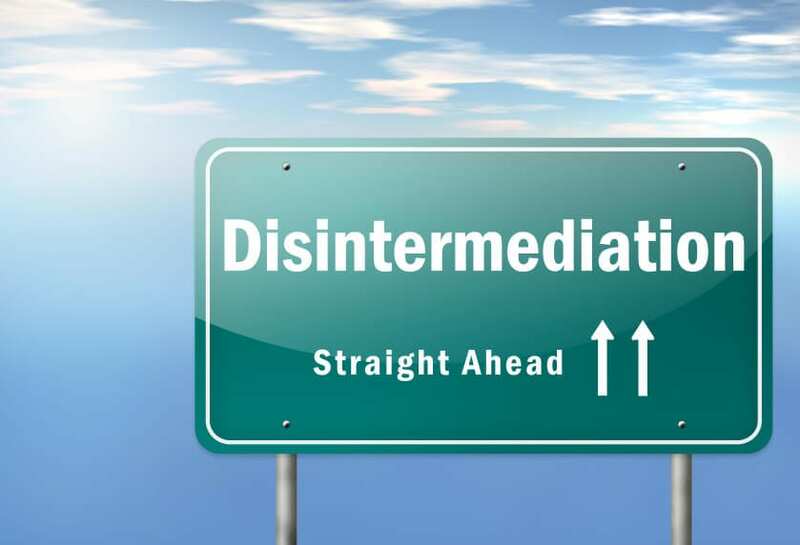 Will the disintermediation impact the recruitment agencies? I suspect it is not a question of “if” but “how soon”. I believe there will always be a place in the market for a service that supplies good candidates to a company that is serious about hiring a qualified individual. Recruiting in the post-recession world will prove to be difficult for companies as many people – though a good fit – will not be as willing to move to a new position for the promise of a better life. A good recruiter will bridge the gap and add a measure of confidence for both buyer and seller. We live in hope! The unfortunate reality is that in the dying breath of the traditional recruitment agent, they are clogging up the system and breaking it. To explain – if I as an employer post a job anywhere, I instantly get a dozen or more recruitment agents contacting me telling me they have the perfect candidate. The poor candidate posting their CV is instantly bombarded with “perfect opportunities” from agents (opportunities which often don’t really exist, but they get another name on their books). Add to this the vested interest the agent has in encouraging unrest, chasing up salaries and creating churn, it is hard to know who they are actually working for. The web creates ideal conditions for creating a true market in recruitment; buyers and sellers being brought together with clever search and screening platforms, but it seems the old style agents won’t give up easily. Roll on the day that they are finally laid to rest.